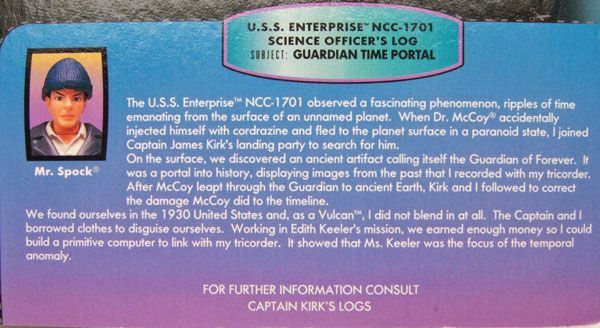 30's Spock was released by Playmates on their Warp Factor Series cardback. The Rundown: Spock finishes off the "City" subset and is probably the nicest of the bunch. 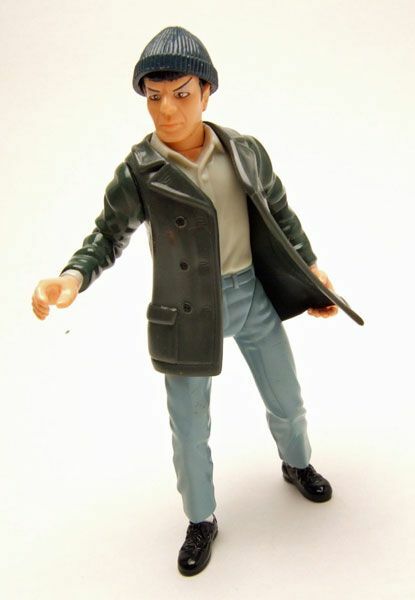 A good solid sculpt and GREAT accessories really put this figure at the upper end of the Playmates catalog. 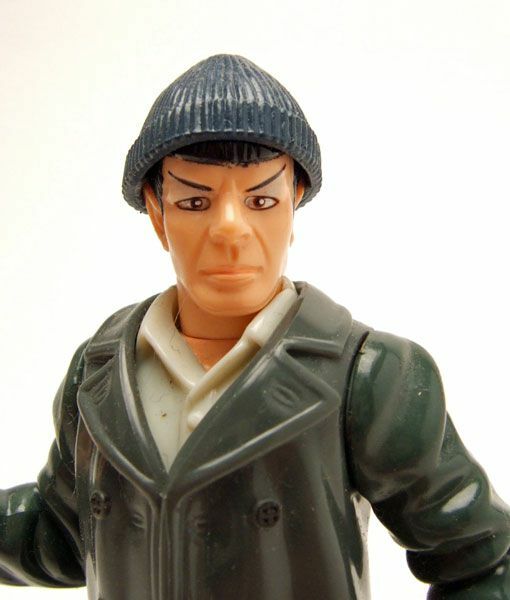 Spock is one of the Playmates' "Warp Factor" figures, which usually means less articulation and more of a "pre-posed" sculpt. For Spock, it really works. 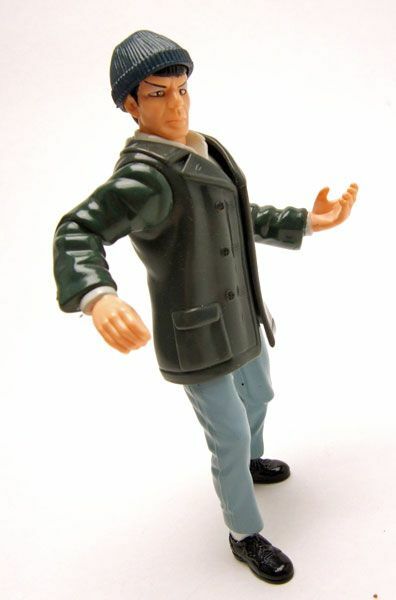 The pose is pretty good, and the lack of articulation helps maintain the detail of the sculpt. I'm a big fan of the sculpting work done on the outfit. 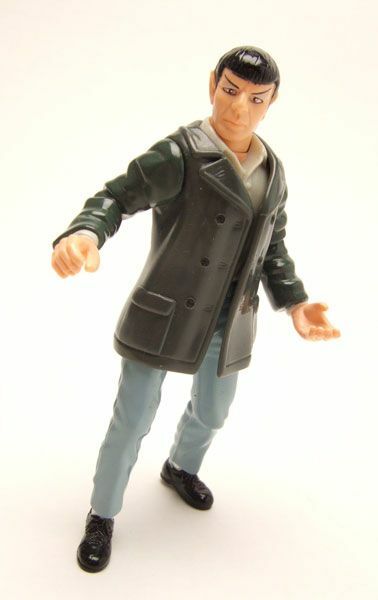 I love that Spock (and the "City" Kirk) have jackets that are actually seperate pieces instead of just being part of the body sculpt. It adds a really nice layered look to the figure. When Harlan wrote "City", he stressed that the clothes that Kirk & Spock nab should be ill-fitting, and not look as if they were tailor-made to their sizes. 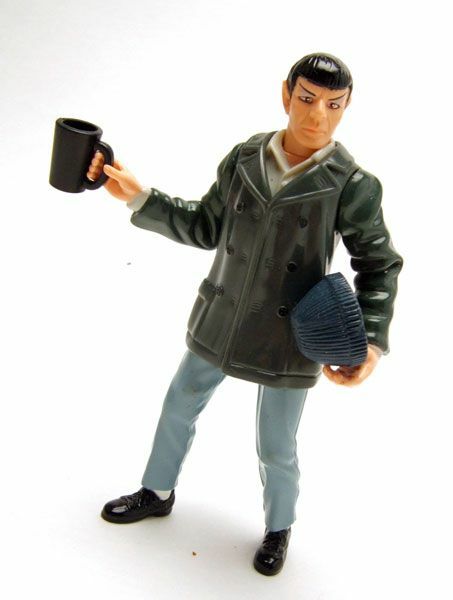 Playmates did a great job of capturing this on Spock, with a slightly baggy look to the jacket, and pants that seem to be a size too small. Nice work! The head is the same as all the other Classic Spocks. When you do something right, why change it? 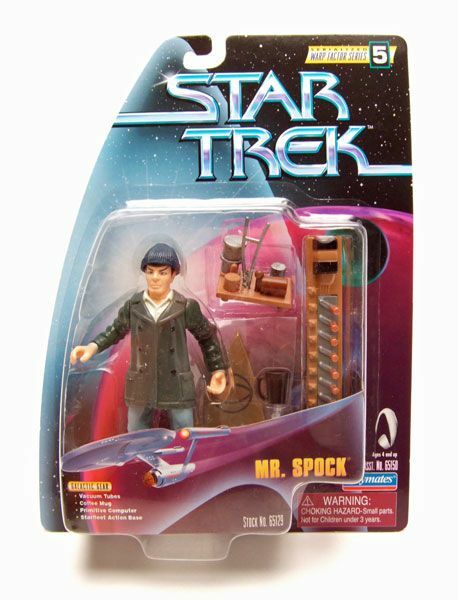 Spock comes with a removable knit cap to hide his "mechanical rice picker" accident. Removable hats at this scale usually look like garbage, but this one actually fits pretty well and doesn't look ridiculously large. 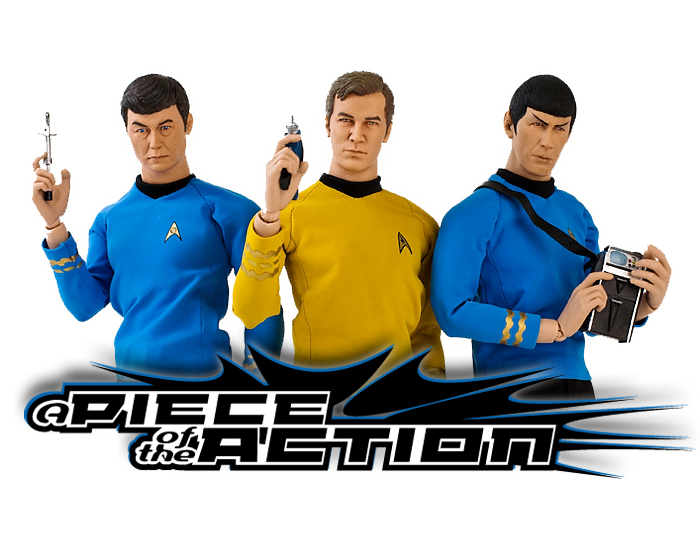 Accessories: Spock has some of the best accessories seen in the Playmates line. 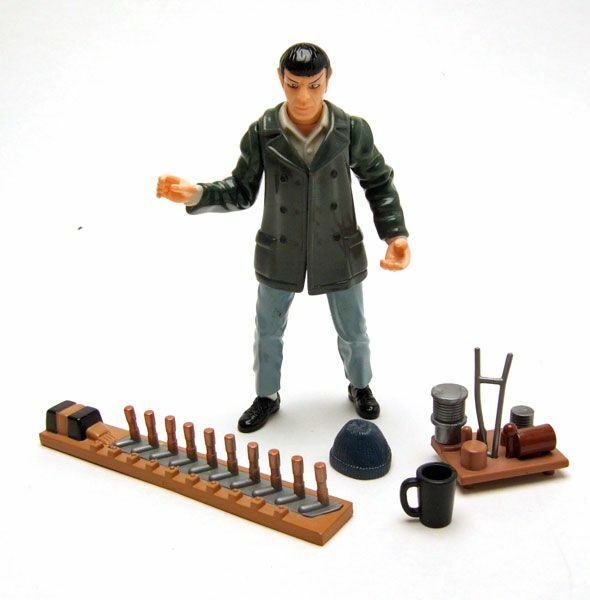 He comes with a stand (not pictured), his knit cap, a cup for serving coffee, and 2 circuit board things that he fashioned from stone knives and bear skins. 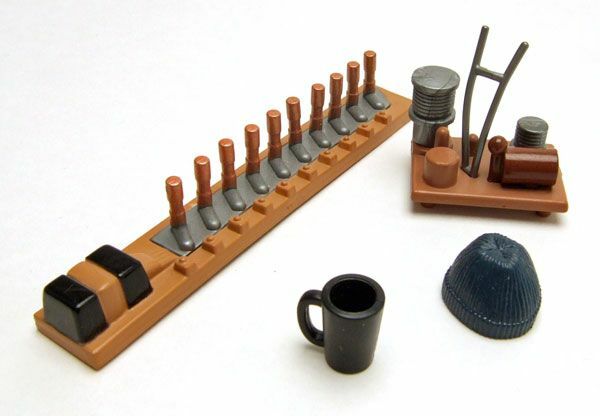 These are both incredibly well detailed for being Playmates accessories! 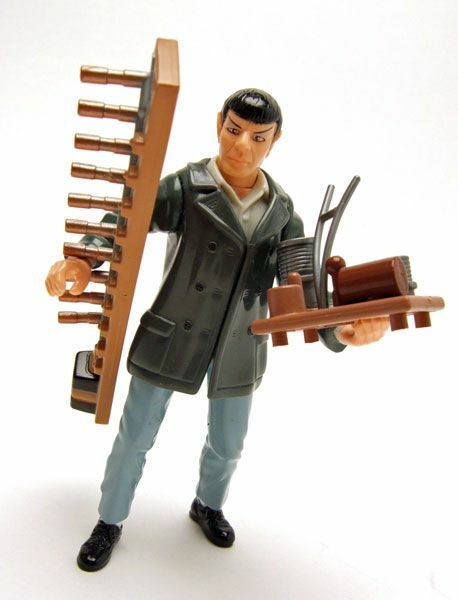 All 3 "City" subset figures are some of my favs from the collection, but Spock here is at the top of the bunch. He's actually one of the best figures of the line in my opinion. Definitely worth a pickup! Actually, go ahead and get all 3! Who doesn't love "City On The Edge Of Forever"! I just hope Harlan doesn't sue me over this spotlight.